Cutting Edge Audio Visual and Information Technology Solutions, Production and Support designed to enhance your performance. Our Core Competency is built upon understanding the Stack of industry tools solutions and the ability to program or create them to make things tick. We offer Innovative Devices, Custom Solutions, and Specialized Support. Next level of A/V Production, accomplished by injecting code into devices accomplishing what humans are unable to do. Windows Operating System Development to provide the most reliable software operation. 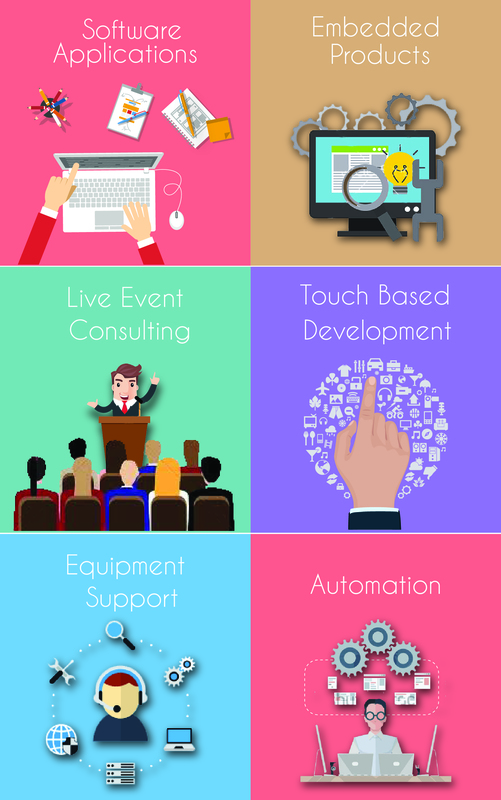 Over 15 years in developing solutions that enhance the user experience through touch. Client enjoys additional space with solutions that take up virtually no floor space. Full White Borderless Projection and just 3 feet of Projector distance maximize room space while providing an Ultra-HD Production. Our Ultra Short Throw solution let us place the projector just 3 feet from the screen and created an expansive 16ft image. No inconvenient space is taken as with past solutions. Because it's near the screen, viewer shadows don't interfere with projection, and more floor space is left open. We created an interactive Twitter Website that allowed users to tweet during the event. Tweets were featured in an asynchronous mosaic display that could be projected when necessary. A mobile friendly portal was also created for non-twitter users. Each tweet using this portal was automatically hashtagged providing social marketing of the event. Optimum space usage means savings. Rear projection or Long-Throw projection have their pros and cons. However the utilization and understanding of new technology equipment means we can eliminate unnecessary space utilization. As 4K gains traction, we are proud to have already adopted 4K production equipment. 4K may not make sense to most consumers. However, the visuals created with Ultra-HD content, change the impact of the event. D.J. Silver joined us in the lab to host a party in V.R. Once we put on the Oculus Rift headset, we transported to Times Square New York where a small crowd gathered as D.J. Silver started to spin his tunes. D.J. Silver has skillz and people across the world virtually enjoyed it. We look forward to continuing to utilize this technology because people dancing in V.R. does something nifty to an ordinary party. Placing screens to view this interaction IRL "In Real Life" that showcases how inhibitions in V.R. simply don't exist. What better way to view a than to have a view of the entire room. We filmed demonstrations and live surgeries in V.R. (Virtual Reality) allowing for immersive learning opportunities. We have also used similar technology in live surgery environments. We recorded and Broadcast the Event, and Created a Special WebVR application that allows Oculus Rift, and the HTC Vive booths to be transported into the room to watch the action. As filming in V.R. gains traction, we are proud to be early adopters and implementers of this technology. We are confident in the ability to produce content and interaction for future clients. The audience enjoys colorful stage backdrop, Image Magnification, and mood enhancing lighting. Today, to send an impactful message, you need more than a microphone and a screen. Often meetings include computers, high-definition imaging, rigging, power, Internet and network services, special effects, virtual meetings, exhibitor services, plus all the traditional basic equipment. Our competency and ability to mobilize technological solutions grew from our corporate clients. We partner to build, enhance, and impact our customers. Our relationships with other event producers and partner companies allows us to produce limitless stage concepts. Concepts play a crucial role in creating engaging experiences, capturing mindshare, and communicating key messages. When it comes time to deliver the key message, it's important to have a team at the helm that is able to execute the steps neceesary to create that experience. Experience is key to ensuring the right person is in the right position with the right instructions to execute. We utilized a new 4.6K camera to provide even better visuals to this TED Style Presentation. We provided drape and uplights from our inventory, and executed a live event, where the mood and every moment mattered. The team received near perfect feedback on the event. Our background in I.T. allows us to understand the importance of presenter content. Slides need to work; microphones need to work, videos need to play because the presenter needs to be able to impact the audience when they desire. Audience enjoys double the content. Powerpoint currently doesn't have capabilities to advance multiple slide shows simultaniously. By using a scripting language we were able to enhance and advance your typical Powerpoint Slideshow. Ever wanted to run two Powerpoint Presentations at once! This is a perfect example of how powerful a few lines of code can be. Developed on the fly to help a Presenter advance two presentations simultaniously. The result was more content in less time by using Two PowerPoint Presentations Extensible to use with more than two! We can only imagine the possibilities. The PowerPoint Multiple Advance Script uses an Focus command to select Each Powerpoint independently and advance to the next slide. The code is written with a 30 milliseconds between switching, which allows the advancing to occur faster than any human being could accomplish. We nullify other advancing features to prevent a user from aciddentially independently advancing. Copyrights © 2017 All Rights Reserved by Dynamix Computers.